Is disability insurance right for you? Educate yourself about why and when to get disability insurance, and what to avoid when you do. Ed Comitz is the founding partner of Comitz | Beethe, a law firm in Phoenix representing dentists all over the country. Comitz | Beethe is consistently ranked as a top boutique law firm in Arizona by Arizona Business magazine, and, according to Ranking Arizona, Comitz | Beethe holds the #1 spot for healthcare firms. The State Bar has acknowledged Ed’s significant contributions to the legal community and for being selected as one of the “Top 100 Attorneys” in Arizona. Ed deals exclusively with private disability insurance claims on behalf of doctors. He has a unique perspective on disability insurance, because in his 20+ years of experience, he’s seen over and over again what happens once it’s actually time to try and collect on a policy. Mr. Comitz is a graduate of Seattle University and Dr. Farran’s alma mater, Creighton University. Howard:	It is a great honor today to be interviewing this handsome charming man. You don't think of a lawyer as handsome and charming and all that but you are, you know. You're a great guy and the reason I have you on here today is dentist always want to learn about root canals, fillings and crowns. They would literally walk from Phoenix to Seattle to see John Quaid talk about full mouth reconstruction. You are an expert. You are in my backyard and I know from all my friends that you are just ... You're probably the smartest guy in Arizona on doctor's disability, no you are, that's what all my friends tell me . I believe because you went Creighton University and that's where I went. You were born smart, you're Creighton smart. You are, Creighton made you that way. At least I would believe that. Disability it's just something that seriously no one wants to think about disability. I'm going to ask you the first question. I'm going to start at basics. Last week I went the [inaudible 00:01:11] graduation. America had fifty schools, they dumped out five thousand dentist now and they're entering the world and they're probably going to have to this decision; Do I need disability? What would you say? I'm going to paint this, don't look at me as a fifty two year old dentist for twenty years who already raised my kids and if i got run over by a car probably nobody would know for a week. If you are twenty five years old and you have two hundred and fifty thousand dollars of student loans. You're trying to eat and survive off Ramen Noodles and Kraft Dinner. Does a twenty five year old kid with two hundred and fifty thousand dollars in student loan need to disability insurance? Let's start with that. Howard:	One in four total Americans? Edward:	That's correct. For dentist about half of them at some point will have to slow down and alter their careers because of issues with their muscular skeletal process. Howard:	Well I have to tell you that I got out of school at twenty four, now fifty two. All I do is I'm always walking around cricking. Starting at fifty the only way I could get rid of the pain without Ibuprofen or a ton of aspirin I start doing hot bikram yoga which now I'm addicted to . People say "Why do you love hot bikram yoga?" Well "I don't love hot bikram yoga, I like that when I'm driving and I turn my head to see whether I can across the lane I don't get an electrical shock up my neck." I'm always still doing this. Yeah so I'm completely jacked up my neck. I tell the young kids get loops, sit up straight. It was just so tempting to lean my ten pound bowling ball over and look directly in the mouth. I think I did it for pretty much yesterday. I'm still doing it. Edward:	I mean Howard I've had a double fusion, a discectomy and double fusion in my own neck. I suffered myself from a lot of pain. I can still practice as an attorney but if I had to be a dentist, I don't know how I would do it. Howard:	Tell us what you said to you mother that made her slap you so hard that you had to get your two vertebrae fused? Edward:	I went surfing at age forty. Howard:	That was a surfing accident? Your head hit the water? Edward:	I was surfing and I hit ... Yeah my head hit a rock and I ruptured two discs so really badly. I had to have emergency surgery. I was in a lot of pain for a lot of years. Howard:	Where was that at? Edward:	That was in Laguna. Howard:	Wow sorry about that buddy. Howard:	Yeah so you would tell a kid, if they said to you "Come on I got two hundred and fifty dollars student loans. I got a car payment." Tell this kid ... You're saying that the kids should get disability insurance. Edward:	I will tell you why. I think that when you're right out of dental school you don't have a lot medical problems. Okay so you're going to be able to qualify for the best disability insurance policy. You're going to be able to get a pretty good benefit amount. It's important to get a true own occupation policy from a reputable company and to get in the highest amount. Otherwise if you've practiced for five years or ten years things can happen. You might go see a doctor because you're having some sort of issue and then they exclude that issue. The best time for a dentist because it's really a high risk profession to get disability insurance right of school. Howard:	Even though they passed ObamaCare which got rid of preexisting conditions that's for your health insurance that would not apply to your disability insurance? Howard:	Okay why don't you go through first of all ... I'm just trying to estimate questions based, on there is probably going to be five thousand people listening to this all around the world. I'm trying to estimate ask many questions. First of all; are all disability policies the same? Is it like, is a hamburger, hamburger, hamburger, hamburger, or what would you be looking for in a disability? Edward:	Right, it's not like life insurance. Life insurance you die, you collect the indemnity. With disability insurance there are different types of policies. You can buy an individual policy, these are ones you get through an independent agent for example through companies like Guardian or MetLife or MassMutual. You can get a policy through for example the American Dental Association. A group policy and there are some differences on those types of policies that's Great West. Then the individual policy and lastly you can have an employer sponsored plan. Where your employer provides disability in turn to you. Of those three types of insurance the best to have is individual insurance. Individually issued policies like if you were to buy a policy directly from the Guardian for example are the best. They have the best language, they're governed by state law and the benefits of state law for example if you're Arizona or California or a similar state is that. If the insurance company acts unreasonably in the administration of your claim, you can collect not only the breach of contract amount which is the indemnity but you can get interest, attorney's fees, bad faith damages and potentially punitive damages. Now if you had an ORISSA policy one that's provided through your employer things are much different. With ORISSA policy is a federal statute applies and it called ORISSA. What that statute does is requires that you file an appeal from the denial of your claims and once the appeal is considered by the insurance company that denied your claim to begin with. Your only recourse is to file in federal court instead of State court and state court are typically much more liberal. Once you’re in federal court, no jury and the judge typically will review the record on appeal and only over turn the insurance company's decision if it was arbitrary and capricious, meaning there was not a single rational basis for the decision. Then even if you win on an ORISSA appeal the most that you can typically get or the most that you can get is your back benefits and a discretionary award of attorney's fees. The individual claim allow you a lot more in terms of damages. The insurance companies will treat you on the claims side much better on an individual claim than they will on an ORISSA claim. Group policy that's not an employer sponsored policy like the one that Great West has with American Dental Association. That policy is a good policy but with their group policies one of the key difference is that the insurance company and the insured Great West and the American Association can change the terms of that policy at any time. They'll provide notice to you that they're changing the terms of the policy. They might say okay we're going to exclude certain types of conditions. You'll receive notice of that but unless you're really fastidious about looking at your mail and trying to understand what you get from insurance companies the policies that you bought might be different than the policy that you get later on down the road. Also with the group policies and the ORISSA policies they're typically exclusions for mental health conditions or limitations from mental health conditions where they only pay for a couple of years. There are exclusions for conditions that are not objectively verifiable. As a dentist my strong recommendation is that when you're buying a policy the best type of policy to buy is an individual policy. Once you've decided you going to buy the individual policy, the next thing you have to think of is what type of individual policy do I want to get. You want to get one that has true, own occupation definition. What that means is that if you are unable to work in your primary occupation which is dentistry, you want to be able to collect the full amount of the benefit and you want to be able to work in another occupation if possible. Those policies will say that total disability means that you're unable to work in your own occupation and therefore it allows you this opportunity to kind of double dip. There are a lot policies that don't provide true own occupation coverage that look like they do. It's important to realize for example there are policies that say you're totally disabled if you can't work in your own occupation and you're not employed in another occupation. If you have that type of modified own occupation policy you need to realize that you're not going to be able to go and be a dental school professor after you file a claim. You're going to be stuck with the indemnity amount. If you have that type of policy you need to make sure that the indemnity amount is enough to support you as you get older. I would recommend that you not buy that sort of policy. Another thing to look for is coasted living adjustments. You want to make sure that your benefit increases with inflation. You want to make sure that there are not any specific exclusions or limitations in your policy. If you have a family history for example of anxiety disorders or depression that sort of thing and that might be something that could disable you later on down the road. You want to make sure your policy doesn't have that type of limitation in it. Howard:	In your years and years of doing this what typically disables a dentist? What is the number one is it like a cataract. Edward:	It's interesting that you say that because the majority of my clients almost all of my clients are doctors. Of those probably eight five to ninety percent are dentist specifically. What disables dentist is their work. What disables dentist is day in and day out having to work in this difficult positions and it's basically arthritis in your neck, in your back. Radiculopathy like you talked about that you are experiencing in you neck if you turned it a certain way. These conditions are slowly progressive, right. These conditions are slowly progressive and they're typically the conditions that disable doctors. The majority of my clients have neck issues, followed by back issues and then repetitive stress injuries with their hands. Howard:	You know what I'm smelling here is we put up three and hundred and seven courses on Dental Town and it just passed five hundred views. You should create an online CE course on this and see if also in this course if you could get someone to be trying to help them how to prevent this. Basically what you said is eight five percent of your clients are dentists and eight five percent of those are work related injury. I would have thought before I talked to you that number one would have been like a motorcycle or a number two would have been like a car. Three would have been like a Kennedy skiing into a tree or surfing in Laguna. I just never would have guessed until you just said that a minute ago that ... What did you say eighty five percent is from work related from just doing dentistry. Edward:	Eight five percent of my clients are dentist versus I mean anyone in the world can come to me with a disability insurance claim. Eighty five percent are dentist and the vast majority of them probably ninety percent or more of them have injuries or conditions related to working as dentist. Howard:	You think you could find someone that could ... Is there any experts on how we can prevent that. I mean you see all these new age things that weren't around three years ago like at work couple of the ladies work for me now they sit on a ball instead of a chair. Some dentist I see on Dental Town are trying to work through a microscope just so they can look straight ahead and let the microscope turn instead of their neck turn. My neck is completely jacked. I mean it's completely jacked and I have to treat that with ninety minutes of hot yoga every other day and it's fine never going to go away. The pain is gone but it still just sounds like fireworks. Do you need of anybody? Edward:	Absolutely. There is a woman here in Phoenix her name is Terry Roach and she's a world class cyclist. I think she had a bunch of world records. She had a company here called Body Stabilization Training. After my accident I went to go see her. She personally has I believe a fusion in her neck, a triple fusion in her neck and she's had back surgery as well. Even after these problems she went on to compete so I thought this would be a good person for me to go to see what I can do. I found out from Terry that the majority of the people who she trains are doctors like dentist for example. She tells them this is how you need to sit when you're at work and this is how you need to practice. She does clinics I know specifically for dentist on how to [inaudible 00:14:53]. Howard:	What is her name? Edward:	Her name is Terry Roach. Edward:	I think it's bodystabilization.com or something like that. She's here in Phoenix and she trains like firefighters and police officers. Howard:	Can you fix me up with her? Do you know her as a friend? Emails yeah. Speaker 3:	How to handle it. What I'm all about is showing people how to select the right policy and then once their policy is denied or terminated that's when I come in. I represent dentist who are having trouble collecting on their policies or whose policies have been denied or terminated. I mean you know we have friends in common who have gone through this disability insurance process. It's amazing how hard the companies fight to not pay the benefits. We both know someone who broke his back and arm in a million pieces. The insurance company was fighting through their own bias doctors to say "Hey I that think you can go back to work as dentist." Not taking into consideration the fact that this person had radiculopathy and numbness and it was unsafe for him to work on patients. It's in insurance companies best interest obviously not to pay claims. Right now with the way the economy is they're not a lot of people buying new policies because they don't have the money to do that. The insurance company is not getting those premium dollars coming in. Secondly the economy is not one where we can all readily invest. I mean real estate is not doing very well, the stock market is not doing very well. The companies who get these minimum premium dollars don't have great investments either. What they do is they take much more strict view of the management of these claims which in other words means they try to figure out ways how not to pay claims. Even though your agent is wonderful and most people agents' are great and they're very knowledgeable and they can tell you about the policies. It's very different talking to you agent versus talking to an adjuster at the time of your claim is filed. Dentist have to be ready when they file claims they should talk to someone beforehand to make sure that they've got all of their ducks in a line. To make sure that they haven't done anything or will do anything that will prejudice their ability to collect on their policies. Unfortunately the claim forms have a lot of trick questions on them. The insurance companies want to interview right away. The interviewers are very adept at soliciting great responses that can result in the denial of you claim. Will seem like they're affable, nice people but that's how they kind of trick you into providing more information than probably what you should. Howard:	Yeah I noticed that so I had four kids so I always had life insurance policy and when I got a life insurance policy when I was twenty five it was nothing, thirty five nothing. Now when I turned fifty and I had to renew my policy oh my god I was surprised they didn't water-board me. I mean they run so many tests and all these things and my point on that is also the premium went up a lot. Howard:	Then I said "What did I do?" They said "Well no wait until you turn sixty." On life insurance it was ten year thing and then at sixty I go to renew it. Then it's probably going to be a lot more expensive and then? On this disability how does the rate work? I'm twenty five I just got out of school, I buy a policy does my policy just got up with inflation? Is it a fixed limit length of time? Is it like a ten year deal and then after ten years I got to reapply again? How is that work? Howard:	Your whole career? Your whole life? Edward:	Absolutely and most of the policies at ... Age sixty ... Some of the policies have lifetime benefits. It's something to consider when you're buying policies. Howard:	You can buy at twenty five non-cancelable policy till you're sixty five? Howard:	That's when most people of them terminate at sixty five you said. Edward:	Yeah ninety percent of all policies terminate at sixty five. Howard:	You and I are old enough to see Enron the seventh largest company in America was there on Monday and gone on Tuesday. How do I know if I buy from these companies. Are they supposed to be triple A rated or five star bond? How do I know which company will be there if I'm twenty five, how I'm going to know if a company is going to be there when I'm sixty five? Edward:	That's a great question but historically the largest company in the country was UnumProvident Corporation. UnumProvident Corporation was a triple A rated company and a lot of dentist were buying their insurance through that company. When the economy turned they started becoming very aggressive with their claims management. That resulted in the insurance commissioners doing a multi-state market conduct examination of their conduct and finding that they were doing things that were inappropriate. They were hiring biased medical examines. They were not reviewing all of the information in the file, not looking at the comorbid effect of cumulative conditions and that sort of thing. Essentially acting dishonestly. There were a bunch of law suits involving this companies. Their practices were on Sixty Minutes and were on Dateline. This was probably the largest company in the country and a lot of dentist are still insured by this company. They ended up settling with the insurance commissioners for several million dollars and in agreement that they would stop engaging in these awful practices. Now they don't sell the insurance anymore. There are some people who have these older policies and who might have claims with Unum or Paul Revere or one of its subsidiaries. This company that triple A rated no longer exists because the types of practices that they were engaged in. It exists but they don't sell insurance anymore. In terms of what you look at with the company obliviously you want a company that's highly rated and most reputable agents will only sell you covers to one of these companies. If a company goes under there is an indemnity fund with the state that insures individuals so there should always money there even if a company goes under. Howard:	One of the things I ... One of my goals on Dental Town is that. A dentist has to many wears many hats, you got learn how to do; root canals and fillings and crowns and then you got to learn HR. You got learn how to do payroll and taxes then maybe your accounting. Howard:	It's just always something. I mean a poor dentist has to wear literally a hundred hats. One of my goals is that i want to make decision making easier like if the person wanted disability or if a person wanted malpractice or whatever that we call it the townie Perk section. The townie perk section for us is that we're going to try to make this easier decision. I think a lot of dentist have comfort in decision making when they say well this what the townies picked. I wish you would look into that or think about that with us because what would be easier instead of a hundred and thirty thousand dentist all trying to figure out if they should go with Guardian or this MetLife or all this or that. Is if we had some collective deal like an expert say "Here is the best decision." I'm going to put you on the stop right now. If I were to buy disability right now who would you buy it from guardian, MetLife? You said Unum doesn't sell it. Edward:	That's a great question. I don't think I can give you a good answer. I mean I could probably give you a good answer. I've stood ... At every one of these companies over time. I don't have the best relationship with them. I think the way you have to look at is you have to look at the rating of the company and all of these companies will have good rating. There are only a handful that sell disability insurance to dentist. You want to look at companies, talk to an independent agent who sells all of the policies and he can tell you about the nuances between one policy and another. Howard:	Where does a dentist find an independent agent that sells disability? 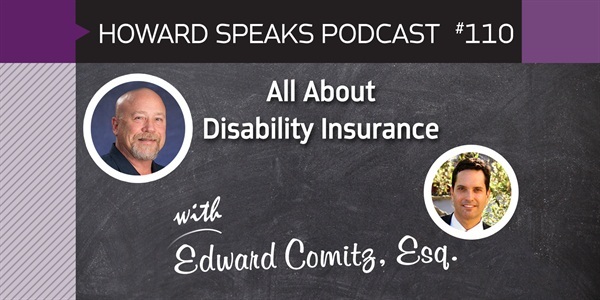 Edward:	Sell disability insurance. You can look in the phone book. If you go to any of the dental conventions there are agents that are there who sell disability insurance. You can just talk to some of them see what's going on. I think it's better to have an agent whose independent rather than a captive agent. This way the agent can say this policy is better than this other policy, I sell both yeah this one is more expensive but it's about their product. That's basically what you need to look at. With all the companies, what you need to look at the most important thing to review is what the definition is of total disability under your policy. You want a definition that says total disability means that you're unable to perform the material and substantial duties of your own occupation. Occupation should be in the singular and not plural because your occupation is defined not as of the day you applied for coverage but at the time you apply for benefits. At the time you apply for benefits they say what was your occupation now. If you have a definition of occupation that is plural and you let's say have a cervical issue and you stop and you ceasing working or you starting working three days a week instead of five days a week. Then you work over at the dental school then you decide you're going to invest in real estate the company will take position that you are a part time dentist, a part time real estate investor and a part time professor. It's more difficult to be considered disabled from that group of occupations than from a single occupation. You want to make sure again that the policy's definition of total disability means that you're unable to perform the material and substantial duties of you own occupation. If you are a specialist like an endodontist or periodontist or the like or an oral surgeon. You can buy from your agent a specialty specific writer which means that if you become disabled, the company can't even say oh yeah we think that you can still return to work as a dentist. You have to be able to return to work as whatever your specialty area is. The most important thing is to get a good definition on own occupation definition that is singular not modified, doesn't say you're unable to work in your own occupation and you're not working in another occupation. Or doesn't say you're not able to work on your occupation and that last three years and after years you can't work in any occupation. You want the true own occupation policy with occupation in the singular. If you're a specialist you want to buy a specialty specific writer. That's what you need to look at when you're buying a policies. Howard:	If a dentist is listening to this on their commute to work and they have a specific question do you only talk to people in the State of Arizona or do you fight disability claims for three states, fifty states. How does that work? Edward:	We represented people in multiple states. What happens is when there is litigation it's we get admitted what's called pro hac vice which is admitted for the purpose for a particular case. People call us from all over the country to ask us for advice but we have to file a lawsuit what we do is we just get admitted in that jurisdiction for purpose of helping them with their case. Howard:	What if my dentist is driving to work right now and well I got a very particular question. How would she ask you a question? Howard:	Spell it out for them. Howard:	They could probably educate themselves on the answer. Edward:	Then people are free to call. There is a place on our website where people can actually ask us questions and we'll provide answers to them. We feel as though the dental community has been so good to us that we want to give back. One of the way we do that is to try and provide as much information that is use able to dentist as possible. I teach a course at the Western regional Dental Convention it's a three hour course on filling disability insurance claims, what to do, what not to do. Howard:	You should film that course. Put that course online. That would be an awesome deal. Edward:	I would love to. Howard:	Online is exploding because it's just so easy. I mean you can literally just lay on your couch with your iPad and watch it as opposed to driving all the way to the convention, you know what I mean. Edward:	Right. The problem with these policies is every policy is different and the words are ... There are limitations and exclusions that are in each policy it's hard for lay people to understand the policies and understand what to do. Like you said as a dentist you have to wear many hats. You were trained in dental school to be a good dentist but you weren't taught how to be a business person, you weren't taught how to be investor, you weren't taught how to deal with staff, employment issues, how make sure your HIPPA compliant, OSHA compliant. What do to do on a disability insurance claim, how to buy a disability insurance policy. What you have to so is you have to rely on other experts to help you. I think that our website provides very useful information for dentists. We have three attorneys here who have a practice in this area and any of them can be called if a dentist has a question. We do free consultations. If someone wants to file a claim we're happy to talk to them. Howard:	I went to Creighton and my favorite Jesuit priest one Saturday, he actually he's knock on my door about six o'clock in the morning out of the door and there was seventy old monsignor priest and he says "Hey can you help me put a satellite dish on the top of the Swanson Hall?" I'm like "What's a satellite dish?" That was in ninety eight. We went up there it took us twelve hours and we assembled this big old twelve foot dish. Yeah that's probably I didn't learn how to use Quicken Accounting and learn how to do payroll, I was setting up a satellite dishes. I am a dentist, I already have disability insurance, I filed a disability and they sent me a letter explaining why this isn't covered. What would be a red flag in that letter to say "Wait a minute?" Because dentist more than lawyers that insurance companies take the dental insurance and don't pay the claim. I mean every single day we get three denials and we're looking at this thing like what do you mean this tooth doesn't need a crown or root canal? It's like Stevie wonder look at the x-ray? How could you say that? Dentist get it. They get it that insurance companies make money by selling premiums and not paying claims. What's a red flag for a dentist? He gets a letter back from the insurance company, what would make you think you should show this to a third party. Edward:	I mean the number one thing if you're legitimately disabled your claim should not be denied. If you're like look I can't work. I'm in excruciating pain every day and they said I can. Well they probably didn't do a reasonable investigation. What the companies do quite a bit, they do a few things that people need to be aware of. One of the things that they do is they hire their own doctors and they get all of their own doctors to sign off on the fact that you're not disabled. They get a functional capacities person to look at the record and say I think this dentist can still work either full time or in a limited capacity. The doctors are bought and paid for by the insurance companies. If you see serially like this doctor agree with us, this doctor agrees with us, this functional capacity evaluator agrees with us. You have to kind of look at it with a skeptical eye and think you know who are these people? Most of them their bread and butter is working for this insurance company. That's something to take into consideration. Most of the insurance companies do surveillance and they think that that's always going to catch you doing something wrong. They'll have the snippet where let's say you're playing tennis or you're climbing Camel Back mountain or you're doing something like that but you complained of having cervical issued. Well I know I can climb Camel Back mountain and I can play tennis but if I have radiculopathy down my arm and I have numbness and pain I shouldn't be operating on a patience. If I drop my tennis racket well I lose the point but I don't hurt someone. I've represented at least one dentist who dropped an instrument down the patient's throat because radiculopathy and the patient actually died. This dentist engages in a lot of other activities that are enjoyable but she can't obviously work on patients. The insurance companies think we've got an aha, we got like you doing something that is difficult. If climb up Camel Back mountain and back, I can do it it's going to hurt the entire time that I'm doing it and I'm going to suffer for days afterward. Surveillance while it might show a snippet in time is not necessarily an accurate indicator on you can and can't do. In a dental chair working in a confined space in a hunched position for long periods of time. Surveillance is one of the things they use. The other thing that they use quite a bit is they have these in house doctors call you doctor and because doctors are busy and they don't have a lot of time. The in house doctor will talk to you doctor and say "I just want to talk about this insured condition, can you tell me this and that about it. I'm going to send you a letter confirming our conversation." This is actually something that happened with one of our mutual friends. Then the insurance company's attorney excuse me doctor prepares the summary and says some things in the summary that are not accurate. Gives it to the doctor, the doctor busy doesn't know what to do looks at it quickly signs it, sends it back. Then we say "Oh no this is not what you should have signed. It's something different." The doctor's kind of pride gets in the way and he says "Well actually I do agree with that now." Or whatever. One of the things we do when we get involved in this claims early on like before you actually file your claim is we let the insurance company know that we're presenting you and that all communications have to go through our office. They can't just show up at you house and interview you. They can't just show up at your doctor's office and interview them or call your doctor, they can't send correspondence to your doctor. What they like to do is they like to all of these things kind of on the down low so they can gather as much information as they think is needed in order to deny your claims. Howard:	Back to these five thousand kids who just walked out of school. What is the average age that someone gets disabled? Is this something that happens to forty year olds, fifty year olds, what would be median, the mean the mode? Edward:	I would say that most of my clients are in their mid-fifties but I have had clients as young as like thirty, thirty two years old. More in their forties but the majority are in their fifties. Howard:	Yeah that's not good, I'm fifty two. I didn't want to hear that. I wanted to hear sixty two or seventy two. That was funny I was working out at [inaudible 00:35:45] the guy swimming next to me turns out he's a paramedic. I said "So how long have you been a paramedic?" He says "About twenty years." I said "So what the average age. I'm fifty two so what age do you start picking up guys for heart attacks like me?" He goes "Pretty much they're all like you." I'm like "Thanks for saying that buddy, I think I'll swim an extra lap today." What else ... Is it true that sometimes people will file for disability, they're getting their claim five years later out of nowhere they say no more no mas. Edward:	Yes. That happen quite a bit. Howard:	Why does happen because I reading the Dental town Boards probably three four hours a day since nineteen ninety eight and sometimes people just post; what the hell. They never even saw this coming. They've been collecting the claim for five, six year and all of sudden they get a letter that no more. Edward:	What usually happens is the insurance company will contact one of the doctors through one of their doctors and get a letter like what I described or they'll do surveillance. Those are probably the two things that result in the most denials of claims. Kind of manipulation of the treating providers and … One type of treating provider that is unfortunately very easily manipulated are surgeons because surgeons like to think they did the surgery, it was successful surgery, clinically successful and therefore you’re fine. I had a successful surgery but I can’t move my neck the way a normal person can. I can operate on someone or look into someone’s mouth or … I have some [inaudible 00:37:28], I couldn’t work with fine instruments. They’ll talk to the surgeons. Surgeons are historically very busy too and they’ll say, “Yeah, it was a good surgery, everything was done accurately. I think that he is back to where he used to be.” They don’t understand the specifics of practicing in dentistry. One of the things that’s really important to do and what we do is we try to educate the primary care doctor on exactly on what you do as a dentist. If a call comes in from the insurance company, you’ve already explained to your doctor. “Look this is why I can’t work in my own occupation.” A lot of doctors too also don’t understand what disability means. They think they it means the dictionary definition. Means you’re helpless but when you buy one these expensive policies, that’s not what disability means. It means you’re unable to work as a dentist, as a clinical dentist practicing dentistry. That’s something very different. Many doctors don’t realize that and when insurances companies say, “He is still disabled.” They’ll say, “Oh no, he is not disabled. He is totally fine. He is not in a wheelchair.” An important thing to realize is the companies rarely educate the treating doctors on what it means to be disabled under the policies and they end up taking advantage of that. Howard:	This twenty five year old kid driving to work. She really wondering, what does something like this cost? How much is this like? Is it a monthly payment, is it a once a year payment? Edward:	There different options, I think it depends on how much you get in coverage. Most people who I represent have policies in the range of probably seventy five hundred dollars a month to twenty thousand to thirty dollars a month. Howard:	That’s not their premium, that’s what the benefit? Edward:	That’s the benefit amount. Howard:	You said seventy five hundred to twenty two five hundred? Edward:	Excuse me. Seventy five hundred dollars a month on kind of the low end, to twenty or thirty thousand dollars on the high end. A lot of dentist should do implants and cosmetics procedures and who have very successful practices can qualify for very large indemnities, a lot of [inaudible 00:39:33]. Howard:	It would have to be other a fifteen thousand dollars a month benefit just to cover your alimony payment, wouldn’t? If I’m twenty five and I buy a policy and let’s say I buy one that is going to be ten thousand dollar a month, the premium and benefit will never change so I’m sixty five. Then ten years later I get divorced and slapped with a twelve thousand dollar alimony payment. Then I get disabled and now I’m making ten thousand a month and my alimony is twelve thousand a month. How does something like that work? Because half of the marriages fail. Edward:	That’s a great question. There are two things you can do. One is you can seek a modification of the alimony payment from the court because there was a change in circumstances because you became disabled. The second thing that you can do if you have a true on occupation policy is you can collect ten thousand dollar monthly indemnity and you can work in another occupation. A lot of my clients go back to school to become attorney. They teach at the dental school. I have a lot of clients who are professors at the dental schools here. You can make over a hundred thousand dollars in addition to your benefit amount if you have the true on occupation policy. Howard:	Most of the dentist that I know that are disabled it was from getting their finger cut in a wedding ring but your side is [inaudible 00:40:56]. Another person would say, I’m a health fitness person. I swim, bike, yoga and everything. I’m not going to have Howard’s bad neck, I’m not going to do drug evasion, he is an idiot, I’m this. Other than arthritis, back posture, what are other reasons people get disabled? Edward:	I have several clients who have problems with their eyes. Glaucoma, Parkinson’s disease, early one Parkinson’s disease, hand tremors, essential tremors. People don’t come to me if they’re paraplegic or quadriplegic. They come to me when they have condition that … With dentistry, the types of conditions that most dentist suffer from and the reason are the easiest conditions to undercut is because they’re slowly progressive. You start having back pain or a neck pain or an essential tremor or Glaucoma or Parkinson’s disease and it happens slowly. What happens you have enough and you’re like, “You know, I can’t do this anymore, I went down from five days a week to four days a week and now I’m just going to quit.” The insurance company says, “Well last week you worked thirty or forty hours a week and this week you say you can work zero hours. What’s the difference, what gives here? That doesn’t make sense, can’t you work twenty five hours?” There are some qualitative differences obviously. If you’re working in pain, you’re distracted; you could hurt a patient because that’s all you’re thinking of. It’s difficult to figure out exactly when to quit. Dentists have to sell their practices and if you stop working completely you’re going to fire sale price on your practice and at the same time if you file a disability claim. When you’ve been working forty hours a week, the company is going to question why now that you’ve sold your practice, why you’re seeking to collect benefits now? They’re going to make it look as though it was choice or a retirement option for you rather than a legitimate claim. Howard:	I never thought about that till you said that, obviously if you’re a quadriplegic the insurance company would be denying your claim. You’re getting all the closure, the fifty shade of gray in the middle; you’re not getting the black and white pieces. Edward:	Right, what we have here is, we have a much different definition of disability than what the normal public is aware of. It’s much easier for a dentist to be considered. The insurance companies are hoping the jury is looking more towards what the regular definition of disability is. They look at these kinds of closer cases and they’re like, “You know, this guy looks healthy, you’ve got a kink in your neck, you might be twisting it a little bit. Why can’t you work all the time?” The jury is going to look at you and say, you look perfectly fine. If you looked at me, you would think, “Why can’t this person work?” Well I can but I’ve to explain to the jury that we’re talking about not being able to work within your own occupation. Yes, we hand the closer cases but this is also very good insurance. It provides you coverage in situations that most people would say, “Well you don’t look disabled to me.” That’s the product that’s being offered to you and you’re entitled to buy it and if you become disabled because you have a condition that doesn’t make you look disabled but is nevertheless disabling to your ability to safely practice. You’re entitled to collect your benefits. Howard:	What I don’t understand is how, looking at your absolutely perfect teeth, stunning smile, how did you pick law instead of dentistry? What went wrong in your childhood to steer you … I mean God gave you a million dollar smile and you picked law. Edward:	I think I was much more adapted about learning the law and how to get around things that I was at science. I’m not … You know with my dentist clients and my doctor clients, you’re all very good at saying, two plus two is equal four. This is an absolute and this an absolute and memorizing these stuff and knowing it and being precise and perfect. What I do and what kind of good I’m at is kind of looking at the naissances and that’s what lawyers do. As I kid I was like that. I would always kind of figure out like, if my mom said, you can’t do this. Maybe I would figure out that actually doesn’t mean what you said it means. I think I’m more of talent in that area. Howard:	Out of the areas of law what made you pick disability? Edward:	I handled a few of these cases right after I graduated from law school and I thought that they were very rewarding. I thought there was a misperception on what makes doctors disabled and that was being capitalized on by the insurance companies and juries were not understanding what was going on. I like working with doctors. I mean you’re intelligent; it’s easy to talk to you. You’re typically coming from a directions and advice. Working with doctors is something I like and admire what you all do. I just started doing it and the more cases I started working on; the more I kind of develop a reputation for this. Once you start doing something a lot and you kind of be known for it, that’s what you get. That’s how I ended up developing this niche. Price is clarity and I think I interrupt you when trying to answer. This twenty five year old girl is still driving out, she is wondering, how much is this policy and how much money should I get and you have been doing this for decades. If I’m twenty five, should I get the lowest premium and get seventy five hundred a month for worst case, should I get twenty thousand premium, thirty thousand? Let’s just say the premium gave you a premium gave you a benefit of ten thousand a month versus twenty thousand a month, versus thirty thousand a month. What kind of difference in premium is that? I mean are you vast in premium a little bit? Edward:	I’m not very good at knowing about that, I don’t know. I don’t sale insurances, when clients come to me, I typically don’t learn from them because it’s not relevant to their cases, how much they ended up paying in premiums. I know it’s expensive and I know that the better polices cost more but in the last analysis you want to have the best policy when you file a claim and you want it to be for the highest indemnity. No one thinks they’re ever going to become disabled but with dentist it’s a real issue. It really is. I’m sure that you have a lot of friends who are in their fifties and sixties and they decided to slow down. It’s just becoming too tasking on them. It’s a very difficult profession especially if you’re doing a lot work … Chair dentistry is very hard on you. Howard:	You said something really interesting, like I have some friends that should file for disabilities from things like MS but the thing is, when an average American thinks someone with MS, they think of very late stages of MS where they’re [inaudible 00:48:29] but in the very earliest stages, it’s very hard to do a root canal when your hand is getting numb and your fingers don’t move. Howard:	You giving insight to me because some people say, “Well this guy was disabled but when I drive home from work, he is out there in his front yard playing basketball.” Well it’s hell easier to throwing a foot wide ball than hold a number fifteen indo file and file your back canal. I mean that’s just two different skill sets. Edward:	The issue, if I can address this, I think you bring up a great issue. Is what we call presentism which is that doctors are making a certain amount of money and they’re at the early stages of a particular condition. It is affecting them but they’re choosing to continue to work anyway. Unfortunately, I have a lot of clients that come to me and say, I have essential tremor, I have whatever because I need to continue working because I didn’t buy high enough value policy. What these doctors are exposing themselves to a lot liability and a variety of retrospect. One way is obviously practice claim that’s file against you. If a practice claim is filed against you and the plaintiff finds out that you had this condition and you never reported it to your board, it’s possible that the insurance might not pay out on the claim. They might say they you essentially defrauded them. There is a possibility that you can get crossways with your own malpractice insurance company. Definitely on your restatement application for dentistry for example here in Arizona every couple of years you have to fill them out. There are questions on there specifically that ask if there is any condition that impacts your ability to practice and if you don’t disclose that and deal with the board on that issue. Something happens later on down the line and the board finds out about it. Your license can be suspended or taken away from you or revoked. There are a lot of risks associated with continuing to practice when you shouldn’t. My best advice to new dentist is, buy the insurance up front so that you’re not confronted with these types of [inaudible 00:50:40] and choices. Where you have to figure out, am I going to continue to work because I have to but I have Glaucoma and I’m not doing my best work. I used be an A dentist who did great work but I’m skimping on margins and my work is not what it used to be and I could end up getting in trouble. Are you going to just file your claim and get the lesser amount that you bargain for? It’s a difficult choice for doctors to make and that’s why it’s important at the very beginning to buy the highest value on that policy with the best coverage and the best definitions. Howard:	You said the range of policy you’ve seen was seventy five hundred amount benefits to twenty two fifty or you’ve seen thirty thousand? Edward:	Up to thirty thousand dollars is what I’ve seen. Howard:	You’ve never seen higher than thirty thousand? Edward:	I have not. If you pay for the policy with after tax dollars, the benefits are tax free. If you’re making at least under the current tax regulations; if you’re making ten grand a month, a hundred and twenty thousand dollars a year. That ends up being actually quite a bit more money. It ends up being a hundred and sixty of seventy thousand a year because you’re not paying taxes on that. That’s something to consider as well. Howard:	I want to stay on price because anybody classically trained in business you should spend a lot of your time wise. Is there a benefit of how I’m going to get handled if I try to bundle this with my disability, with my malpractice, with my life insurance? Should I be looking for a company thinking that, if I buy five products from him, I’m a better customer. Is that an issue? Edward:	That’s interesting. I’m not aware of that occurring. I know some people use one agent to buy multiple products and there might be sort of discount that’s applied but I haven’t been previewed to any kind of discounts through bundling. Howard:	Do you think I have with my disability since I can still do dentistry but I can no longer be a chip and drill? Edward:	Absolutely come and talk to me. Howard:	Come to you because it’s hard dancing with my neck and hanging upside down on a pole is just out of the question. Well I only got you for five more minutes. If you have five minutes, what would you be telling us? They’re driving at work, they left an hour ago, they’re five minutes away from their office. What would be your closing remarks? Just go for the close. Edward:	We talked about buying the best insurance possible on the front end. I think on the back end, what people need to do is be very prepared when they file their claim for disability insurance benefit. I think before anyone files a claim, they should actually talk to an attorney so that they can everything in line and make sure that they don’t do anything to prejudice their rights. Like you know with dentistry, it’s a lot easier to do something right the first time than to fix it after the fact. You just want to be prepared. If you go to our website there is a lot of useful information that can help you be prepared. A lot of people retain attorneys to help them with the process and that can be helpful. You want to make sure that you get someone who really knows what they’re talking about in this particular industry. Ask the attorney questions, like the types of questions that you’re asking me to see if they know about the industry. I’m lucky in that, there only a handful of companies that we’re dealing with and I have a relationship with in house counsel at almost all these companies. We’re aware of the industry practices because we’ve sued the companies; we’ve deposed their executives and we know what’s going on. When you what the practices are, it’s much easier to manage the risk and make sure the people that legitimately disabled get paid, when they’re supposed to get paid. Howard:	Can these five thousand podcast listeners look forward to a day where you might do an online series course? Edward:	Absolutely, I’d love to. Howard:	That three hour course maybe you’ll put that online? Howard:	The best thing is that you bought this insurance but this Terry [inaudible 00:54:58] taught you how never to get an injury. Howard:	I want to meet that person. Edward:	She is very, very good. She is very, very good and I mean after I was injured she improved my stamina and ability to sustain positioning a lot through exercise and posture changes and the like. I think she even has CD or videos that can kind of teach people what to do. Howard:	Well that was an amazing hour. Your reputation golden in the backyard. You really helped my friend. Thank you for all you do, thank you for giving me an hour of your time. I expect I’m getting to be billed for this, right? Howard:	You’re an attorney. You’re going to email me the bill? Howard:	It’s going through US Mail? Edward:	I appreciate it actually. Howard:	Seriously dude, you’re a great guy and you’re a great attorney. You‘ve got all kind of awards; I didn’t read your bio like I should have but you are. You’re an outstanding attorney and you have a golden reputation, you helped my friend and thank you for all that you do, for my dental colleagues in the great state of Arizona and around the state. Edward:	I really appreciate it, thank you so much. Nice chat. Howard:	All right. Have a great day.